Regardless of the material, roofs are supposed to last for decades. That said, many don’t live long enough to see the end of their lifespan. 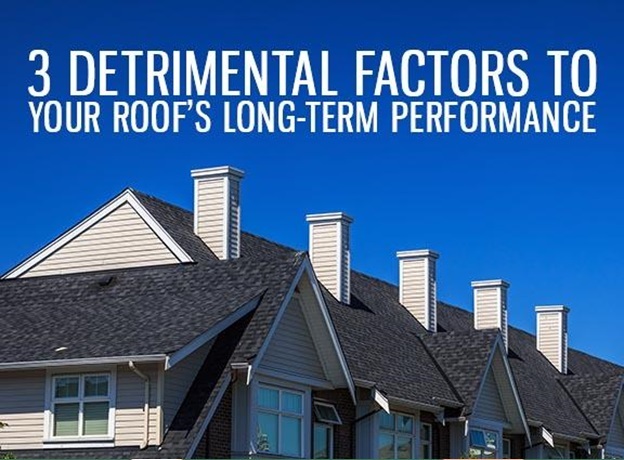 As structural deterioration begets a decline in performance, your roof may not be as good at protecting your home when its integrity is compromised. As the true authority in Northern Virginia roofing, Peak Roofing Contractors wants to share the most common reasons roofs wear prematurely. This way, you can do a better job at protecting your home’s primary layer of defense. Mother Nature is the chief culprit. Year after year, the rigors of brutal winters and oppressive summers would eventually take their toll on your roof. This is why you have to be particular with inspections and repairs. Even the most resilient roofing system may not hold up against unusually severe weather. The key is to be cautious about the condition of your roof all year round. Regular maintenance is necessary even if your area hasn’t been hit by destructive weather in recent memory. Normally, this should be done every few years; but if you want real peace of mind, you should have your roof professionally checked before and after the roughest season of the year. You should also remember that not all roofing materials are created equal. The upkeep requirements of one are different from the other. You have to know the best maintenance practices required by Virginia roofing systems so they can be cared for properly. Poor workmanship can set the stage for premature defects. This is why you shouldn’t entrust this major project to Class B or C contractors—let alone unlicensed roofers. If you pick a company just because they’re the cheapest choice, then you may well get what you pay for. At Peak Roofing Contractors, we take immense pride in having and maintaining a Class A license. Our team also holds the coveted Master Elite™ status, which means we’re second to none when it comes to installing GAF® roofing in Northern Virginia. And because we can offer you the exclusive Golden Pledge® Ltd. Warranty, your roof will have workmanship coverage for 25 years. Having a long-lasting roof starts with making a smart decision. Call us now at (703) 745-5153 and let’s get your project rolling.